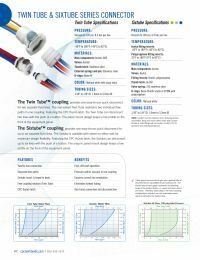 The Sixtube™ coupling provides one easy-to-use quick disconnect for up to six separate fluid lines. The Sixtube is available with valves on either side for maximum design flexibility. Featuring the CPC thumb latch, the Sixtube can disconnect up to six lines with the push of a button. The snap-in panel mount design keeps a low profile on the front of the equipment panel.